*NEW GIVEAWAY OPEN AT BOTTOM OF POST!! After years of struggling to get pregnant, and having multiple early miscarriages and chemical pregnancies, I finally received multiple infertility diagnoses (High FSH, Low AMH, Low antral follicle counts, Endometriosis, and MTHFR single mutation). Although I was only 32 at the time, the doctors said- sorry, you have bum eggs and nothing can be done about it. They said I needed to use donor eggs. Enter Dr. Google, and ALL the fertility books ever (haha, at least all the ones published by 2014). I read, and I read, and I read. I took notes, I made lists, I discovered. 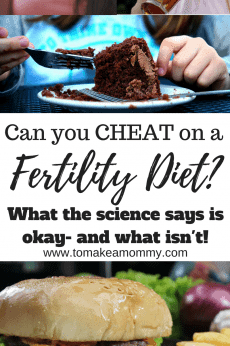 And one thing, which I read about first in Rebecca Fett’s It All Starts with the Egg (life changing fertility book, by the way, get it NOW if you haven’t already read it), is that there is a developing body of scientific research showing that CoQ10, can do really tremendous things for egg health. She has an 11 page chapter in the book that goes into full detail on the research behind CoQ10 and egg health if you, like me, enjoy nerding out on these things! In her second edition she also specifically mentions this kind of CoQ10 that I am giving away- The Bio-Quinone Gold – as one of the best kinds! CoQ10, a substance found inside of everyone, works to energize our cells at the mitochondrial level- the level on which developing eggs and sperm are operating on. Healthy mitochondria=healthy egg and embryo quality. As we age, our CoQ10 levels decrease, and our egg and sperm quality can decrease. The natural order of things. 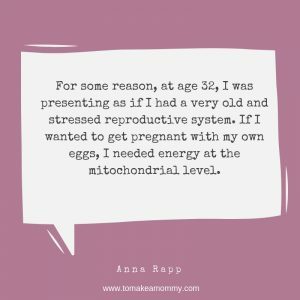 For some reason, at age 32, I was presenting as if I had a very old, stressed, reproductive system (my clinical results are also called things like Diminished Ovarian Reserve, or the super scary Premature Ovarian Insufficiency). Among other things, including diet, other supplements, eliminating toxins, and doing mind-body work, I needed CoQ10. I needed energy at the mitochondrial level. I needed a reboot! Now, eggs take about 90 days to develop, and CoQ10 takes several weeks to build up in our tissues. So, bascially, while I was doing ALL THE THINGS for 90 days to try to improve my egg health, I needed to also be taking CoQ10. 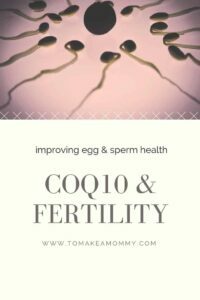 As I did more research, I learned that CoQ10 could also help with sperm health, so my husband started taking it as well. We went to BJ’s (our local discount wholesaler) and bought the cheapest Ubiquinol version of CoQ10 we could find. We didn’t really feel a difference, but we did get pregnant naturally– twice!! (Now, I recommend this highly-bioavailable CoQ10). Of course I was doing 79 Things, and he was doing a whole slew of things for male fertility as well! There are two different kinds of CoQ10 that are sold in capsules- Ubiquinone, and Ubiquinol. Most of the scientific research has been done on Ubiquinone, but some research shows that Ubiquinol is about twice as bioavailable as Ubiquinone. That means you need about half as much. BUT Ubiquinol is more expensive because its more difficult to make in the laboratory. There is also a third class of CoQ10 I’ve recently learned about- highly bioavailable Ubiquinone that is easily absorbed by the body. You need about the same amount of this type as you do Ubiquinol. It’s expensive also. Now, I’ll get to the good stuff. My husband and I finally tried some of the good highly bioavaiable CoQ10 and we have been blown away. About twenty minutes after we take 100mg we are filled with energy. Like drinking a latte only without the sugar and caffeine crash! I can’t imagine how much more powerful this formulation is for fertility health than the cheap stuff I was taking before (even though it was Ubiquinol!). The kind we take is made by a Danish company called Pharma Nord, and we take their Bio-Quinone Active CoQ10 GOLD. They also have an Ubiquinol that is more expensive, but their Ubiquinone is so highly bioavailable, we are happy with it. In general, you are going to be okay taking any Ubqiuinol (it should say “Kaneka” somewhere on it), or a specialized Ubiquinone. The people at the company who make this say their internal research shows that the body can only process about 100mg at a time, and any more it generally pees out. So we take our doses with at least an hour or two in between them. AND we always make sure to not take any after 2 in the afternoon or so, so we don’t wind up with insomnia! Did you catch that? Let me say it again . . .
Take your doses spread out- 100mg at a time, with at least an hour in between each dose. Take them in the morning so you don’t get insomnia at night. Take less if it upsets your stomach (although research shows you can’t really overdose on this stuff). Eat some fertility friendly fats with your dose- avacado, olives, coconut butter, nuts, seeds, etc., to help your body process the CoQ10. 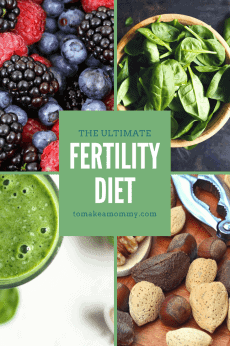 I encourage all my readers to take charge of their fertility journey and make a load of changes for optimal egg (and sperm!) health. I don’t know why you wouldn’t take CoQ10 unless you couldn’t afford it (yes, it gets pricey!). I’ve partnered with PharmaNord to giveaway 3 large boxes of their Bio-Quinone Active CoQ10 Gold (the same kind my husband and I take). That is 300 pills of 100mg each. If it was me doing this for egg health, I would take three pills a day for 90 days, so these boxes cover that (270) with a little left over! To enter the giveaway, fill out the form below. The more entries, the more chances to win! Enter by midnight EST on Monday, March 25. Winner will be picked on the 26th! May the odds (and baby dust) be in your favor!! I knew there were different kinds of Ubiquinol, but I didn’t realize just how much of a difference there could be. Thank you for the guidance on CoQ10! Really good info! I have been eager to try this coQ10! Thank you for the opportunity! This is great info and I’d love to win! I’m 41 years old. Not what I would consider old, but in the eyes of docs, I’m “ancient” which is depressing to say the least. 🙁 The first time I had FSH, AMH, and E2 levels tested was 4/30/18. Numbers weren’t great. 🙁 FSH was 17.0, AMH was .182, E2 was 20. RE told us that I was premenopausal/low ovarian reserve and IVF wasn’t an option because she didn’t typically see good stimulation w/numbers such as mine. After finding this blog, I was convinced I could change those numbers and went all in. I retested in mid-October and my FSH was down to 9, AMH was up to .984, and E2 at 25. YES!!! I’m super-excited! This makes all the hard work I’ve put in these past several months worth it. Praying we can conceive naturally, but worst case we’ll be able to go for IVF. This is really inspiring – thanks! 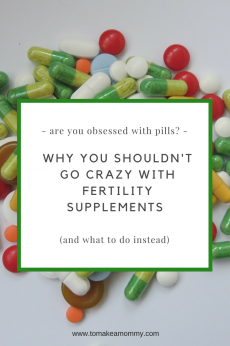 I’m hoping CoQ10 is my miracle supplement as someone with unexplained infertility. Baby dust to all! Cripes, this is my final thing of what felt like the 100 things I need to do to enter the comp! Lol! 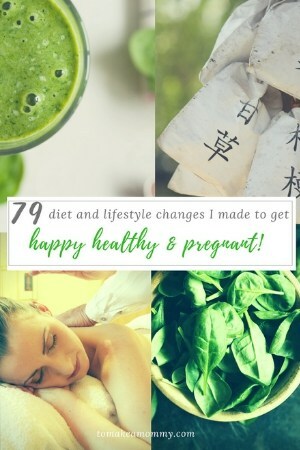 I have been following probably around 85% of Ana’s list of things she did to fall pregnant. I’ve read “It Starts with the Egg” & have also begun to implement her suggestions too. Fingers crossed 2019 is my year!!! Am I missing something? I don’t see anything to fill out to enter. Thank you for your wealth of information! I am so glad I found your blog. My acupuncturist recommended CoQ10 for egg health too. It’s great to learn how important a good quality CoQ10 is because I was going to buy it at BJs too!! I’ve also been cleaning my diet eliminating dairy and gluten, making sure I’m getting enough healthy fats, and eating organic. I’ve switched out cleaning products and have begun to switch out a lot of beauty products to safer versions. I’ve been feeling great! Never knew about spacing it out. I guess buying the capsules that are over 100mg is not a good idea because then you can’t do that… Thanks for the info! Cool I’d love to try! So how did they diagnose you with Endometriosis? They did an emergency surgery for a suspected ectopic and found it while they were in there. Of course they didnt remove it, but offered a follow up surgery to remove it, which I declined. I’m still so frustrated they didn’t take it out while they were in there, but rules, and whatnot! My acupuncturist recommended Co-Q10 to me when I began my journey. I would be delighted to try a more bio-available formulation! I also take COQ10 to improve egg health and I think that it has made a difference. The doctors were very worried with my eggs (high FSH, diminished ovarian reserve) but with my first IVF we got three good embryos. We are about to transfer the last one this cycle, praying that it takes!! I just read the book It Starts With the Egg. So much good information! I’m trying to eat healthy, avoid toxins and add supplements to increase my egg health. Anna, honestly thank you so much for sharing all your hard work and research! I’m hoping CoQ10 is my miracle supplement. I went through a holistic fertility program with Gabriella Rosa and have ready all the books and put in all the work. I hope I win! I have switch to a clean diet with no dairy. I am also doing daily fertility smoothies, daily fertility yoga, weekly acupuncture and of course taking daily vitamins. I didn’t realize the difference of quality in coq10 so your post was extremely helpful! I am 26 but already have dangerously low AMH levels. So my egg health has been top priority to try and boost what I have left! Thank you for your encouraging words, your blog and emails help me to keep on track! After being married 8 years and several miscarriages and 3 operation because of stage 4 endometriosis. I felt defeated after everthing that has happend. But i have new hope for 2019, i am back on my “ be fertile” diet and taking care of myself again. Taking my supplements and tea’s, etc. But it is expensive so your give away is great. 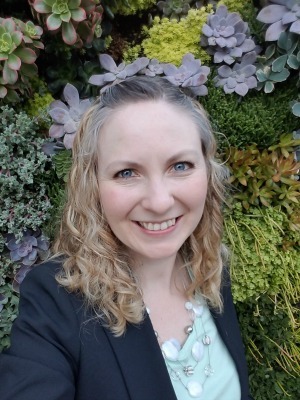 Such great information – I learned a few things and will definitely be changing my approach to how I take CoQ10. I also have egg quality issues along with low AMH, high inflammation, and a double MTHFR mutation, and my husband has sperm quality issues. Just another thing to add into our knowledge bank! This along with DHEA and some other supplements to help my body detox/reduce inflammation better because of my double mutation I know & believe will make a difference! I’m eating lots of fresh veggies and greens, lots of avocados, and lots of protein. I also take ubiquinol, folate, whole-food vitamin C, vitamin E, and omega 3’s. Great post and super helpful!! I do need to get back into taking CoQ10 daily. I’ve been taking ubiqinol for egg health. My doctor told me 300mg three times a day!!! And my husband 200mg daily. I usually get in 300mg twice a day , but it’s good to know maybe I should be spreading it out differently. I’ve also been doing your other diet recommendations and I just signed up for Robyn birkins fertility warrior workshop! Thank you Anna!! First of all… you’re crushing it! Second of all…. woahhh!! 300mg 3 times a day??? I’ve never heard of such a high dose!! But the studies say you cant overdose so if you can afford it . . . . But maybe double check they really meant that much? ☺ enjoy the intensive!! I love reading all the information you share! I have incorporated some of the supplements you recommend. I have started to change out toxic products with clean ones, and have reduced the use of plastics a ton. Very informative! I take ubiquinol now, a clean brand recommended by my acupuncturist. I’m curious how this one compares. Thanks for running a giveaway! My husband and I have been taking CoQ10 for about 9 months now & it’s made a huge difference in his sperm quality. At our last IUI his count increased over 30million! Which is a bonus bc we have NO MF issues. Since taking CoQ10 I’ve noticed that I’m growing follicles more efficiently – & hopefully that means healthier eggs too! To further our attempt at improving our chances we have adopted a completely sugar and grain free diet. Eliminiated most plastic from our lives & have replaced most of our “normal” household products with natural/clean alternatives. We have been TTC since June 2016 & have had 3 miscarriages. 1 from a “surprise pregnancy” (that started our TTC journey) & 2 from our iui’s. We have done 3 Clomid cycles & 3 Clomid + IUI cycles. Our latest loss was in October. Hopefully the new year will bring our Rainbow! PS- thank you for doing this giveaway. Good quality CoQ10 is so expensive & all our treatments are out of pocket (0 insurance coverage for infertility.) So, winning this would help relieve some of our financial burden too. So, like I was saying… THANK YOU! Good luck, everyone! Thank you so much Anna! I’ve heard lots about COQ12 but never known enough to try it. Is it something that would be useful for those without a period at all? I’m 44 and my partner is 56 (57 in the spring) so we could use all the help we can get! I have a Cancer history ( all genetic testing showed negative so I don’t carry the genes) so the small risk of clomid’s increased Cancer risk is not something I want to risk, and my doctors will only approve one round for the same reason. It’s very risky for me. I was given a timeline to get pregnant ( about five more months from now) which adds to the pressure. Doctors want to do a hysterectomy if I don’t get pregnant ASAP.. I began eating Whole Foods, plant based and organic in college( early 90’s). Lots of leafy greens. And also began yoga and meditation in my teens. In my twenties, I switched to all natural cleaning products and laundry and beauty.. and don’t wear much make up, etc anyway for most of my life. I have been tanning omegas in and off since my 20’s as well. I moved to an apt that has better air a year ago and exercise daily. Walking mostly. But also try to do more. I began taking a pre natal daily early summer, and d3 before that. I tried one bottle of coq10 from Trader Joe’s but don’t feel anything. And ran out. I don’t usually gluten, dairy, sugar, caffeine, etc also since college. I have food sensitivities bf had an ulcer in college too so that was the reason then. I also stopped alcohol then. Have had only occasional or small amounts since. I have been getting acupuncture about once a week for two years now. I also give myself reiki ( I’m a Reiki practioner). I, too, have been taking the cheap stuff. This would be a God send for me! Thank you Anna for your amazing inspiration! As always, really informative! Thank you! Interesting question! In general it’s good for most people whether they are trying to conceive or not. For TTC though, CoQ10 is good for egg and sperm health. So if you don’t have your period but are still trying with your own eggs, I would think it would be worth it. If you aren’t then you probably don’t need it! I’ve also read that CoQ10 helps with blood sugar issues – it’s touted as the natural Metformin. Great information! I have been trying to eliminate toxins and eat as clean as possible! Thank you, Anna! You are such a blessing to so many of us! CoQ10 seems to be the miracle supplement for egg quality! We are eating healthier and cutting out all the bad stuff. Cleaning naturally & affording bpa. We’ve been trying for 8.5 years. I have been taking Coq10 but never did much research on the different forms. Great article, thank you. Was wondering if you had thoughts on dessicated beef heart for its coq10 content. I have been taking CoQ10 and think that a better quality product would have a better effect. I also take D3 supplements, NAC, thyroid support, and fish oils. I have been taking all of this since my last miscarriage in August. I have also gone gluten and dairy free and have felt so great doing so. I haven’t taken CoQ10 yet but have read great things about it, this is an exciting giveaway. 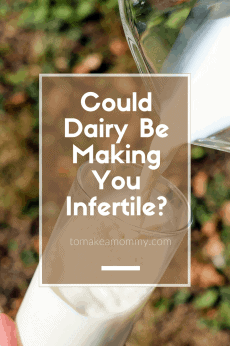 I have been trying the natural route for 3 years as we have undiagnosed infertility. I know the mind-body connection is a big one for me as I have the diet down. I’ve been looking at circle and bloom because it’s currently discounted. This blog has given me great recommendations and I’ve taken several of them already. I know it is helping my husband and I get to our little one. Very exciting to read this, I’ve read a bit about CoQ10 but hadn’t looked into it very much. My husband and I are going through infertility for the past year, and are currently doing letrozole for our second round this cycle- is it doesn’t work out this cycle or the next, we’ll be on a 3 month break and I’d like to try out coq10 during that time after reading this! Good luck to everyone and lots of baby dust!! Do you take it while breastfeeding? I’m excited about this! I already take this supplement but I’d like to try the more ready bio available one. Thank you for sharing! Thanks for the tips and baby dusts to all. I’ve been taking ubiquinol for 2 years now and I got them from costco but they aren’t exactly cheap. I’d like to try this brand of ubiquinone to compare. I just turned 40 a week ago and have been trying for closer to 5 years now with no luck yet. I’ve just started acupuncture and eat clean as much as possible. Hopefully this month will be the month. Baby dusts to all the ladies here! Really interested in trying this supplement. So far on my fertility journey everything looks OK except I have PCOS and I’m still not ovulating on my own. After a chemical pregnancy, I’m starting to get worried about the quality of my eggs and this supplement seems like a great addition to my current routine. I am wheat free, and want to be sugar free, I have to mentally work up to that, and I am toxic free body products and at home the cleaning products are too, but I clean for a part time job twice a week and use regular popular cleaning products for that:( I am getting there, oh and I am taking best nest fertility vitamins. We have been trying to conceive for three years now. I take Qunol Ubiquinol along with a prenatal, probiotic, vitamin D, and myoinositol because I have PCOS. 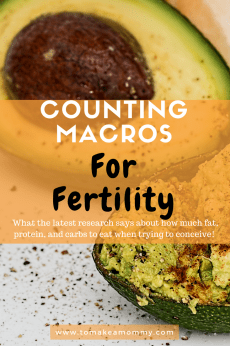 I truly believe that CoQ10 could be the missing link to finally get us pregnant as I know poor egg quality can be an issue for women with PCOS. It’s been an uphill battle but I’m optimistic we will conquer this. So many beautiful women wanting to be mothers. All of your comments are so touching. We have one year to conceive beginning in January. My husband is 46, I am 41. It took over a year to get him on-board so I’m doing everything to help our chances and adding this supplement is another key to our success. My fingers and toes are crossed! Otherwise I’m following a fertility-friendly diet, reducing stress, and staying active. Just recently added melatonin to my supplements. Thank you for doing this. Here’s hoping we get lucky. I take 600 mg and hubby takes 300 mg right now cause we figure I need it more but would be great if we could both take 600mg. So glad I found you online. Praying 2019 is our year for baby #2 after experiencing 2 miscarriages this year. Hope to win, thank you. I started breaking up my doses now after reading this. Before I was taking it all at once. I didn’t notice it anywhere though, when will you announce who the winner is of the drawing? Sorry Jill! I announced the winner in my email newsletter! So glad you are breaking up the doses now! How many mg did you take a day? And how did you determine the amount you were supposed to take? Natalia, there is research supporting 300 mg a day for fertility of highly absorbable CoQ10 (like this one) or 600 mg a day of poorly absorbed CoQ10 – like cheap Ubiquinone. I’ve been using COQ10 for about 2 months. I just recently bumped it up from 200 to 300 per day. We will see how it goes! Thank you for the opportunity, Anna! I am so excited to try it and see if it makes a difference, so fingers crossed! Thank you for this wonderful information! I will certainly be adding this to my regimen. I just read it starts with the egg, I will definitely be adding this to my daily regimen as well as my husbans’s. Thank you so much for this giveaway! The prices can be daunting, but worth it. Thank you for offering this again! This CoQ10 is amazing, and one of the most expensive supplements I take. I would love to win this! It would be a great help to my natural fertility route! I’ve been eating healthy and taking my vitamins. I’ve been wanting to add coq10. I took some in our first few years of trying. Thanking you so much for doing this! I’ve been eating better along with working out to improve my health! I love your website Anna. I found it a few months ago, and have been following everything you suggested. Hoping and wishing for the best! Love the giveaway. Apparently I’m not doing enough! Interesting read about this CoQ10. I did read the book as well and got some Ubiquinol but sounds like this one is the best. I practicing yoga, doing circle and bloom, affirmations do even bought my self a ring that looks like an egg and sperm🤣 the doctors said the same things to me. And hoping to be an 🦄. Good luck everyone and many blessings. I’m about to start an IVF cycle so I’ve been doing a lot. I’ve been taking CoQ10 for a few months and now loves that book! I’ve been loving your blog as well. Thanks! I’ve been eager to try this version of CoQ10. Fingers crossed I win! So informative!! Thank you for all that you do in spreading the good word!! I am a believer in these small changes! I hope that they make my body a welcome nest for a baby. In July of 2018, after a horrible miscarriage (kind of redundant, but it really was), my AMH was 1.61, my FSH was 24.2, and my LH was 41. After the last four months of really drilling down on supplementation and reducing toxic chemicals in my life, my AMH is 1.86, my FSH is 3.9, and my LH is 4. (These values were last week!) I am sure the CoQ10 was a part of it! I have had 2 miscarriages in the last 6 months so I’m hoping and praying the next one isn’t nun rainbow. I am taking ubiquinone and only 100 mg of mega ubiuinol but it is expensive so can’t afford to take more a day, hopefully I get lucky and win the giveaway. Thank you for the ST Catherine prayer. This is one more step towards a fertile womb! Good luck to all! I really do feel like there’s more spring in my step after taking this for a few weeks! Hello Anna, thank you for this helpful information about COQ10. I hope I could win in this opportunity so I could give myself good chances. May Saint Anne, the Mother of Our Blessed Virgin Mary help me and my husband to become parents this year. This is really informational! My husband and I are taking CoQ10 but we never felt a surge of energy. We want to try these! I appreciate this opportunity to get such a great product. I purchased their CoQ10 gold but it is in soybean oil and I started getting an itchy throat (unknown soy sensitivity) but they were so kind and I was able to exchange for their Ubiquinol product in coconut oil. I have only tried one order of their product and I’ve had a good experience so far. Also, they have great customer service. I literally just put some Co-Q10 in my cart on Puritan’s Pride! Very helpful- especially since my situation sounds similar. Thank you! I am taking care of myself with healthy eating and exercise. Drink at least 8 (8oz.) glasses of water everyday.